Confused by how to put together shape, cut, clarity, color, and symmetry into a single decision? We advocate a clear, step-by-step approach to building a performance-driven choice. We encourage comparison shopping between several jewelers at every stage of the buying process until you are comfortable narrowing down your choice to a single jeweler. This doesn't need to be precise — you can adjust this later. Tip: Never bought a diamond before? Try visiting a few online stores to get a feel for what a comfortable budget is for you. If you are buying for a spouse or partner, try to find out what shape and size your partner prefers as she or he may already have a preference. Don't worry too much about this: you will have an opportunity to adjust this later. 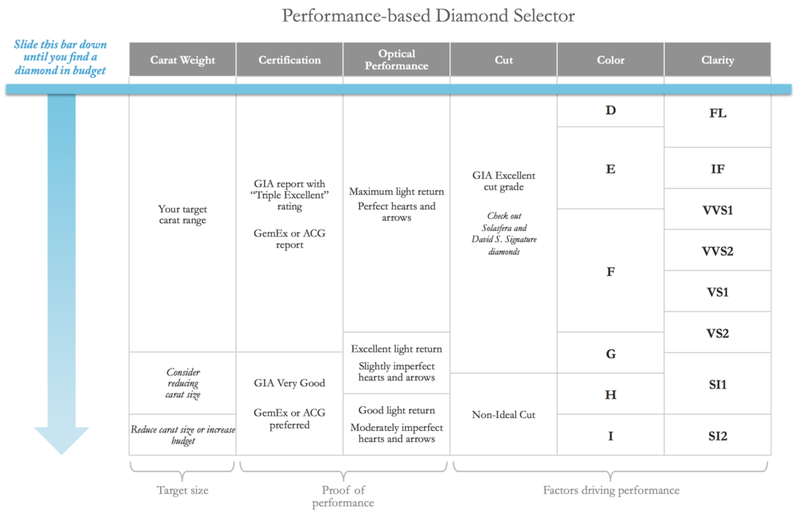 Our performance selector has been designed to balance all of the factors that determine the performance of a diamond. It also incorporates the important verification and proof necessary to prove the performance of your diamond. If you're still over budget, the chart prompts you to reduce the carat size or increase your budget accordingly, then repeat the process. We recommend comparison shopping throughout the process until you are comfortable with your jeweler. By using our performance selector, you will not only find a diamond with the best possible brilliance, but also obtain the key measurements and certifications necessary to prove its quality and performance. Please call or visit us if we can help you on your diamond-buying journey. For further research, you may find the articles in our library helpful.